The fact that “heat rises” makes your attic one of the most important rooms to insulate in your home. As much as 25% of all energy loss can come from the attic, so if you insulate your attic alone you can see a change in your utility bills by as much as 15-50%. When an attic isn’t properly insulated you can potentially see ice dams, being caused by melting snow, being formed on your roof. When ice dams form, so will pools of water, and that water will over the course of many winters cause damage to your home. With proper insulation you can keep your roof healthier for longer and keep your attic freer from moisture which creates mold. Many people with uninsulated attics simply use the space as a storage area. 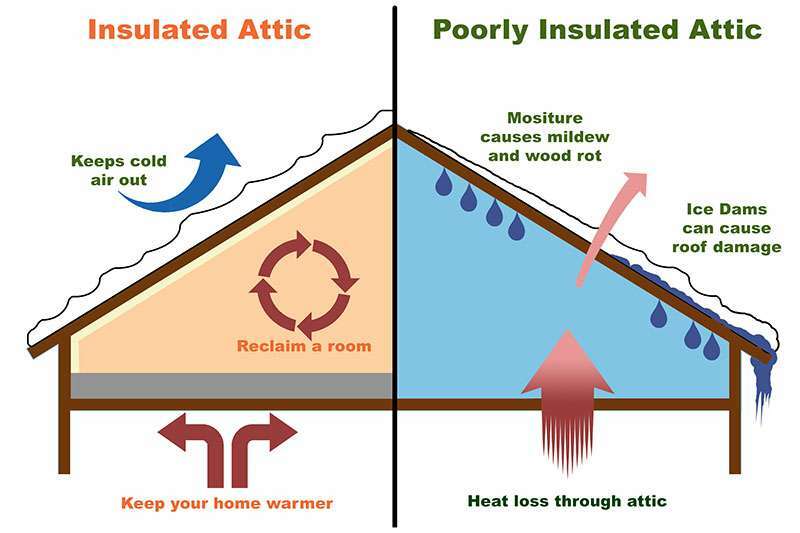 Once insulated, the attic becomes as warm, and comfortable, as any other room in your home. This means that you could finally create that home gym, office space, or hang out spot that you have always wanted to. Schedule a FREE No Obligation Attic Estimate Today! A insulating foam plastic spray which applies as a liquid and then expands to make an air-tight seal. Since Cellulose Insulation is created from a mixture of recycled paper products and binding agents to bring it together, cellulose is considered a “green” product. Cellulose insulation has been used for decades to insulate homes for warmth. By insulating your garage you will be protecting your pipes from freezing in winter.